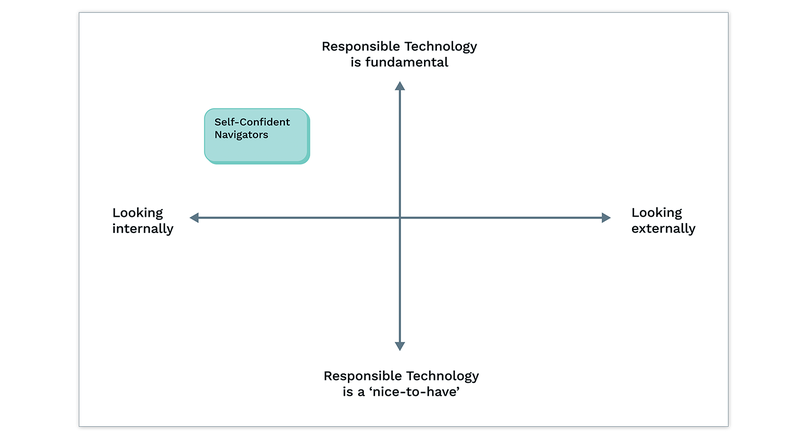 As Rachel Coldicutt, Sam Brown and the team at Doteveryone continue to drive forward the conversation around responsible technology, at Albion we’ve been helping them dive into the attitudes and behaviours of self-identified ‘responsible tech advocates’. Doteveryone’s new TechTransformed programme brings the abstract ethical discussion into the practical, real world. In our previous post, we discussed how advocates tend to share a number of similar perspectives (do take a look if you haven’t had a chance). But to make this effective we also need to embrace the differences that exist within the community. At the end of 2018, we conducted 15 hours of interviews with those responsible for technology delivery, exploring what they felt their responsibilities were in tech development beyond their users or shareholders. If we map each interviewee on a simple set of axes, defined by these two parameters, we see four attitudinal audience segments emerge. 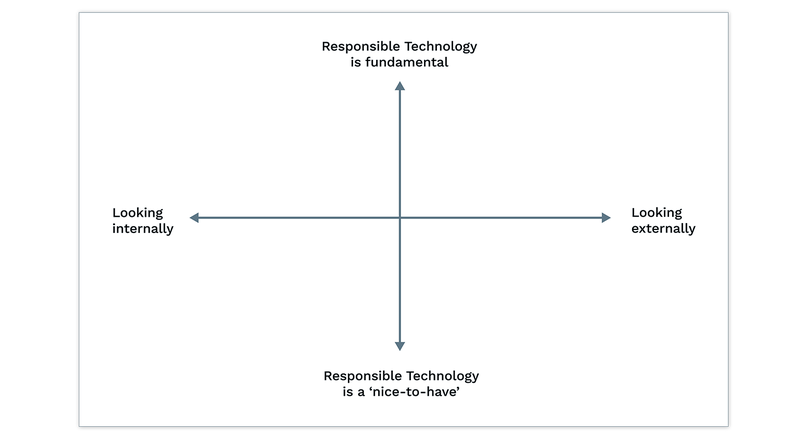 Each segment has a role to play in pushing responsible tech forward as the discussion grows, and any approach to support responsible product development must take these into consideration. These are the advocates for whom it’s not simply about being part of a ‘responsible community’, but demonstrating leadership in this area. 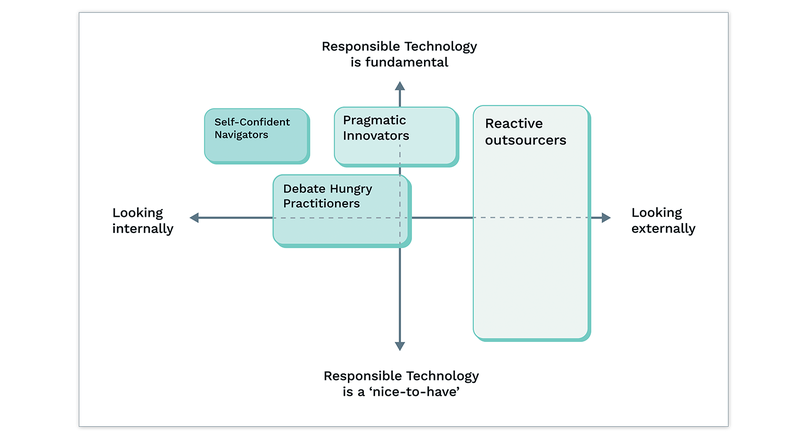 Their ways of working, both personal and professional, instinctively consider and address the concerns raised by the nascent responsible tech movement. This means that whilst they will still occasionally seek knowledge on key issues, they have confidence that their instincts will serve them well, and ensure they themselves, and the organisations they work for, will continue to do the right thing. 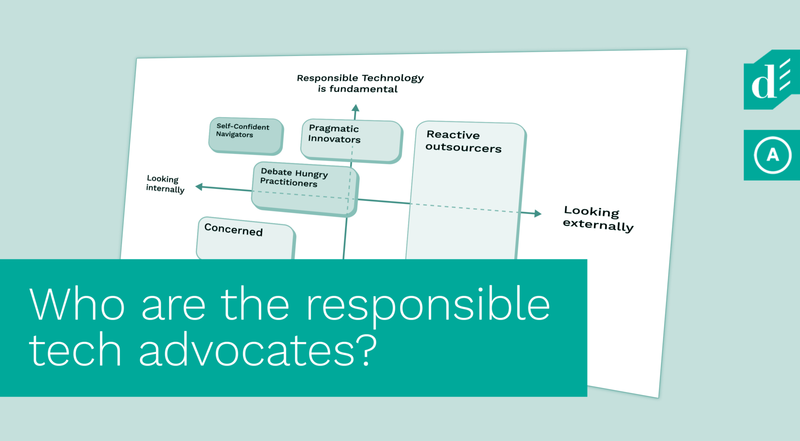 Pragmatic innovators are convinced that adopting a responsible approach is fundamental to business success in the current environment. They tend to occupy more senior roles and in many respects, they are clear on their stance for several aspects of responsibility, but they remain a little unsure of exactly how to translate this stance into practice. As such, they’re on the lookout for simple, relevant examples, tools and frameworks that they can adapt to their/their businesses’ circumstances in order to continue to move at pace, while, at the very least, avoiding worsening their already stretched capacity. 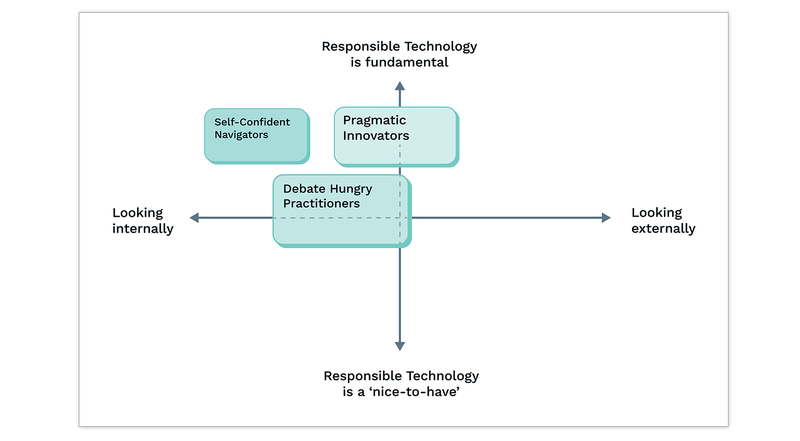 In contrast to the pragmatic innovator, the debate-hungry practitioner tends to have a little more capacity to engage with responsibility conversations and will seek them out in order to feel part of the community and solidify their stance on particular issues. As such, they will have often chosen a workplace based on the knowledge that there is space for such conversations. But, they’re not simply looking for intellectually stimulating discussion, they need to feel that they are working towards tangible solutions. They are as likely to use discursive ‘establish our principles’ tools as well as more practical ‘get to the answer’/’checklist’ tools. For a not inconsiderable chunk of the responsible community, responsibility is simply one of many issues they are trying to juggle in order to ensure the ongoing success of their business. While they recognise the growing conversation in the area, they don’t have the bandwidth (or inclination) to become an expert in the subject and as such are happy to take shortcuts and defer responsibility to an authority, as long as they are ‘covered’. There is one final group worth mentioning, but one that we feel represents a ‘point in time’ as opposed to those more attitudinal segments. We met a number of people who are concerned. They tend to be very new to the responsibility discussion, having had concerns highlighted to them by recent developments, and they’re often worried about ‘getting it wrong’. They’re in need of help from a trusted authority who could show them the way forward. Once they become more familiar with the key issues currently being discussed, they tend to gravitate towards one of the attitudes previously outlined. Do these attitudes ring true? These initial reflections have begun to provide some focus for the development of Doteveryone’s TechTransformed programme. But it’s important to remember that they’ve emerged from a small sample of discussions, so we’d love to hear your thoughts. Do the attitudes ring true? 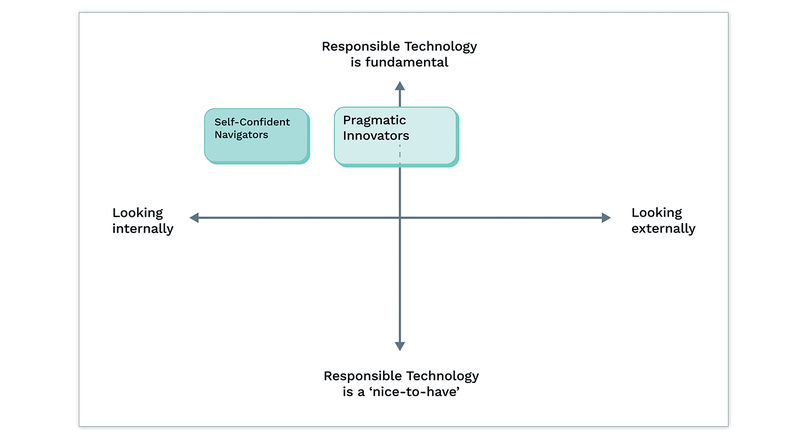 If you work in the sector and are interested in helping to shape this field from the beginning, please sign up to take part in an interview on Responsible Technology. And over the coming months, Doteveryone will be releasing more resources to support responsible advocates and embed ethical decision making in the product development process through the TechTransformed programme. They’re encouraging you to test these resources out in the field and share your feedback to help the team to build the most useful process for translating ethical challenges into practical product decisions. Sign up for updates, don’t miss the latest developments and help push this field forward. You can genuinely make a difference.